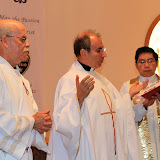 On September 17 Monsignor Mario Alberto Molina Palma takes his position as archbishop of Los Altos – Quetzaltenango in Guatemala. The former professor and dean of the Faculty of Theology of the University Rafael Landivar has been the bishop of Quiché since the year 2004. Quiché belongs to the archdiocese of Los Altos. He is the first Augustinian Recollect to have this distinction of archbishop in the modern times. In our interview, as he talked of his episcopate the bishop opened to us his heart of a pastor. Monsignor, you are a Panamenian by birth and blood, are you comfortable with your assignment as bishop of Guatemala? September 2011, Italy - The International College of the Order in the Italian capital hosted a hundred Filipinos, Panameños and Argentinos a week after the World Youth Day in Madrid. The youth, who belong to different groups of RAY, celebrated Saint Augustine’s feastday (28 August) together with the Augustinian Recollect religious residing in the three communities of the Order in the Eternal City. WYD was not only Madrid. The nearly two million youth from all over the world who responded to the invitation of the Holy Father lived the first week spread all over Spain, hosted by different dioceses and several thousands of families. Then they gathered in Madrid and there lived an unforgettable experience of communion, this time with the youth of all the world and, in the case of the Augustinian Recollects, with the members of the RAY coming from 11 countries, in their first ever world encounter. The Order of Augustinian Recollects has just renewed the text with which it regulates its life and in which it defines its being, the Constitutions. The decree of promulgation, signed by the Prior General Miguel Miro, is dated August 28. It is a text wherein St. Augustine is made more present. From now on it should be the basic nourishment for the religious in the task of renewal, and a guide which orients the restructuring of the ministries. On August 22, 2011, the New Constitutions of the Order have been promulgated by the Prior General; it is a fruit of a revising labor that lasted six years. This text which describes the ideal Augustinian Recollect and regulates the life of the religious, is borne out of a will for renewal which found its river-bed in the General Chapter of 2004. From that well represented assembly to that celebrated in October to November 2010, all the communities and organisms of the Order dedicated themselves to reflect over their own lives and to suggest improvements in the legislation. Brazil - Irsef Iván A. Souza, the new president of the fraternity, takes charge of the preparation. He will be aided by three councilors in organizing the activities to celebrate thirty years of Augustinian Recollect life in the Brazilian state of Pará. The Augustinian Recollects aim at addressing the needs of the 21st century men and women according to their charism. In the last General Chapter – the highest instance of government- they decided to begin a process of revitalization that will bring them to revise and to adapt their structures in order to be able to live radically their religious commitment to serve God and his people. The working group whose members were appointed by the Prior General, with representation from each of the eight province of the Order, held its first meeting in Rome last June 7 to 10. The members of the working group met at the General Curia.